A six-part on-demand series of excerpts from - India playing host to the most attended FIFA Youth World Cup in history. This is part-five. Catch up on part one, two, three and four. FIFA announced on the same day that the match would be rescheduled and moved from Guwahati to Kolkata and tickets would be available only online starting 20:30 the same day. You remember part-three where I mentioned our site taking a hit for a second time, well this was that second time. Now, to put things in perspective and help you understand the position all stakeholders were put in by the rain Gods and the speed of decisions that needed to be taken once the venue was moved. A decision to change a venue for a World Cup semi-final is definitely not an easy one but is definitely one that has to be taken at the very top. We (Local Organising Committee) had to wear two thinking caps prior to the decision, one that kept all the planning for Guwahati moving and also attempt to dry the pitch (I’ll tell you how later) and two, the initial thought of what we would need to do if Kolkata was to be the host of this semi-final. Let’s talk about Guwahati first. The teams (Brazil and England) had already arrived after playing and winning their quarter-final matches in Kolkata and Goa respectively. Our pitch consultants along with our tournament director were there too, working with the ground staff, sports authority and state government to find a solution or somehow stop the rain. There was a ray of hope in the form of sunshine the morning of the 23rd but I assume the damage from the water over the past week was already done. Even a helicopter was arranged to hover over the pitch to try and get it into any sort of playing condition, but in vain. We got about a 90 minute heads up that the call had been taken at the top and that an official announcement had to be made. This public announcement needed to be an all-encompassing one, that addressed the Guwahati stakeholders and ticket-holders as well as what this means to Kolkata and how one could get a ticket for this game. In essence, a complete operational plan needs to be thought through and actioned immediately. To list out the direct and indirect stakeholders in both cities that played a part to make things happen – state government, sports authority, airport authority, police, media, local venue team, ticketing agency, broadcaster, concessionaire, volunteers and of course FIFA and the LOC. First things first, how do we get the teams to Kolkata with immediate effect? Our logistics team had to work overtime on this one much like all other departments. Next, we had 23,800 tickets holders (not all paid) whom we needed to appease. 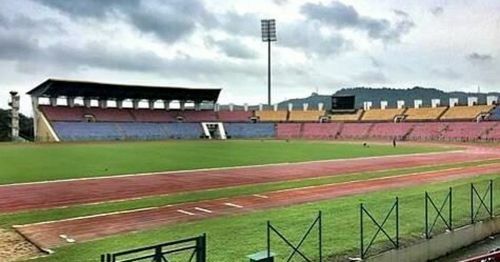 We needed to work out with the authorities and our ticketing agency the best possible way this could happen and at the same time allow for ticket-holders in Guwahati to have the chance to attend the match in Kolkata as well. We needed two things done in this case, setup a refund counter with a specific time limit to collect refunds in cash and the other was ensure we had a specific Guwahati ticket-holder window in Kolkata once we made the collection in Kolkata live. Nobody in their right mind plans for something like a venue change especially in a World Cup, which meant we had not planned for requiring 66,600 extra physical tickets at the Kolkata venue. This meant we needed to have the remaining unprinted ticket rolls from all closed venues to be sent overnight and in time for collection on 24th and 25th. 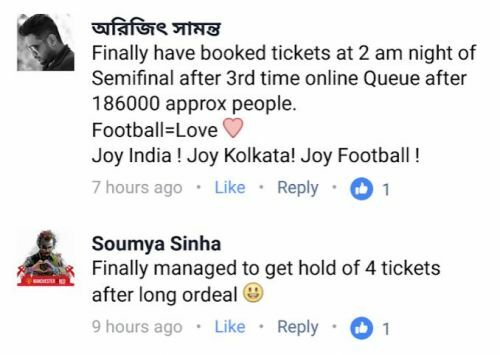 In Kolkata, we needed a way to make sure that getting a ticket for this mouth-watering semi-final was a fair opportunity for everybody. The more I think about what we did, the more I realise how driven to the cause we actually were. Almost anybody else in that position would have jumped at the opportunity to make extra money to cover costs of the venue change or make an extra buck in general. “I’ve got it! All categories, all sections, basically all tickets, sold at one minimal price and sold only online – first come, first served.” We pondered on that for ten minutes, thought through the ramifications of ticket collections and all the stakeholders involved. Given that Kolkata had already delivered eight successful matches so far, we gave everyone the benefit of doubt and knew that this would be the real test. “Let’s do it!” 100 rupees per ticket was the fairest price point so that tickets were accessible to all. From a Kolkata football-lover point of view, this ended up being the opportunity of a lifetime. In retrospect, this plan was good but turned out to be plain genius when everyone worked together to execute it. Immediately making the calls to all the stakeholders to inform them of what we intended to do and the timeline of everything that needed to fall in place prior to kick-off on 25th, we got to work. Not sure if everything that got planned and decided within that hour and thirty minutes can get captured in a few paragraphs, but it holds testament to the fact that when one is prepared to make educated decisions and trust them, everyone else will trust those decisions too. Eventually. Having given ourselves a few hours after the announcement to be ready for the online release, we did not anticipate what was coming. Our website team along with the FIFA social media team were pretty much up till the next sunrise. In all likelihood, about ten times the number of tickets available online was the number of people trying to buy tickets. Just imagine if we had opened physical counters to sell these tickets (part of our earlier tabled discussion), chaos! The implemented thought process held good; since one person could buy a maximum of four tickets online, it further reduced the number of people who came to collect the physical tickets the next day. Two of the lucky ones! For a Brazil England game at Salt Lake, I'd wait longer! As soon as we realised the demand is as predicted, we initiated all other operational aspects like concessions, security, volunteers, etc. keeping in mind it would be a full stadium 48 hours later. In the meantime, the teams were put on a charter flight and arrived in Kolkata just before midnight on 23rd. We got relevant banners printed on 23rd night for the box-office ticket pick-up counters on 24th. We also strategically opened the booths once we were sure the physical tickets we needed had arrived or were expected anytime soon. Making sure the police were around to organise the excited Kolkata crowd was important too. Even though the ticket price was the same for all tickets, we needed to print the tickets by category (different colours) so that we still were able to follow operational plans on match day. This meant we needed some kind of order of distribution, and hoped that the ones who came to collect their semi-final ticket were fine with it literally being ‘luck of the draw.’ But then again they were already the lucky ones. Looking back, was it really just an Under 17 World Cup?